A wonderfully simple story told using only the four words of the title plus one at the end, ‘there!’ These few words are used playfully and imaginatively in different combinations to enjoyable and comic effect. The book also shows how a little comma makes a big difference to the meaning. 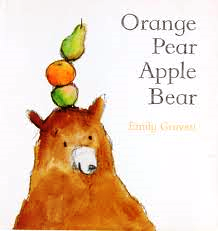 Emily Gravett is a multiple award winning author/illustrator, including the prestigious Kate Greenaway Medal. Read the story aloud, taking time to talk together about the pictures as you do. Talking about the book is a good way to deepen children’s enjoyment and understanding of the story. Read the story again, this time leaving spaces for children to join in with the repeated words and phrases. 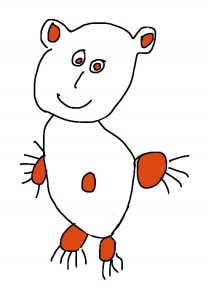 Encourage older children in this age group to notice and recognise individual words. They might begin with a word beginning with the same letter as their name or the name of a member of their family or a friend. After hearing the story a few times, children will get to know it well. Encourage them tell it to you in their own way, using the pictures to help them. Children can use a bear animal toy and real fruit to retell the story. It’s a good way for them to get to know the story well and helps to make the book more interesting and memorable. Children love playing with sounds and words. What other words rhyme with bear? Bear/pear/chair/dare.. What other words can you think of together that sound the same? Dog/log/fog/jog… Cat/mat/rat/sat… plum/gum/mum/yum. When you run out of ideas, think of a new word to try.